Each year the Egg Hunt at Calvary Bible Church is a key ministry event that we use to reach people in our community with the Good News of Jesus Christ. We impact young children, their parents, grandparents, and even other relatives with a very God-centered Easter event. It's meaningful and it's FUN! You've received this invite because either you've helped with an event before, or have expressed interest. Please look over the opportunities to be involved and sign up for a spot. We'll be able to follow up with you easily through this web service. The Easter Egg Hunt is Saturday, April 20th, from 10am-12pm at Calvary Bible Church, Erie Campus. Volunteers arrive to check in at 8:45am. We want to be fully prepared and ready for guests to arrive as early at 9:45am. We need people to visit as many area businesses as possible and hang a poster on their community bulletin board. Our target area is Erie and surrounding communities. We will set-up inside on Friday April 19th at the Erie Campus from 10am - noon. We will also need a crew for set-up Saturday morning 8:00am to put the eggs out on the lawn, set-up bouncy house, set-up food, etc. Welcome guests, and get them started on the hunt. 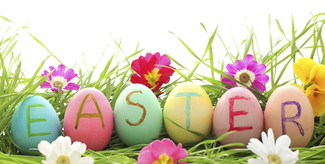 Welcome families and help them find an open table and Friendship Host after they have collected their eggs.. Your objective is to be friendly and engaging while being lead by the Spirit as you inquire about their potential interests. Information about the ministries of Calvary Bible Church will be available. Pray for the ministry before and during the event. Run a craft table or cookie decorating station. All supplies will be provided. Teen friendly role. Come help with the indoor set-up: tables, chairs, carnival games, decorations, etc. 10am-noon on Friday April 19th. Arrive at 8:00am to help with the outdoor set-up: put eggs out on the lawn, bouncy house, balloons, etc. Run a carnival game. Teen friendly role. Come help us clean up. Many hands make light work :) 12pm-1:30pm.